Without saying a definite yes or no yet, I wanted to gauge how many would be interested if I were to do a final short run of DRM1X (Major Drum Expanders - no more DRM1s themselves). Price may have to change somewhat from before - I will quote things up once I have rough numbers. I would imagine that I would need 20 to 30 to make it viable. Of course with the options to swap cases to 5FW or full Powered Frames. Gah! I jumped for joy at the title then at it being expanders only. Fwiw if anyone is selling I would buy their drm1 then I would want an expander, but nobody seems to be giving these beauties up! Saving my money for a drm2 but if there is still demand for drmx go ahead! I found an expander for my DRM1 here, but I'd still be down for one just to support the reissue... and if I ever stumble on a vanilla DRM1 I want to expand. DRM2 does, of course, somewhat complexify things - still haven't attempted the tweaks to rescue that project. Hopefully that can be sorted within the next few months. Drm's really are soso good...pls rescue it! I got access to a mates drm1 and hes done a diy expander but he would be totally up for the proper one. +1! I hope this happens. Great news! Even though my 2xDRM1 are already expanded, I want to chime in and just say that the expander add so much functionality! It transforms the DRM1 to a complex patchable monosynth with several waveforms, 4 decay envelopes, and fantastic modulation possibilities! 1 expander for me, cheers. i think i'd like another expander. so please count me in. OK - consider it something I will seriously consider - once settled back in Bristol. The main question is time - the juggle of regular production. OK - consider it something I will seriously consider. this may call for a considerable celebration. Here's the DRM-X holding down the bassline (in a crazy sort of way). Shout out to batchas for the Radio Music module in Bug format which is playing the higher, plinky melody part. I'd be interested in an expander for one of my two DRM1's. If available, will it come in a case with room to add the DRM1 next to it? I know it's not how you do things but I'd be happy to pay up front if need be. it seems there are 14 takers so far. Woah. I love this kind of sound. And the beat is great too. Pers. I'd put the beat volume more in the front, but most problably the way you mixed is exactly what makes it interesting. BTW, there's a dedicated DRM1 thread if you make a video with the beast later on. Yes, absolutely - either a 5FW case (for DRM1+X setup) or a full Powered Frame to fit in other red modules alongside..
rpc has very kindly sold me his so I'll inherit his interest in an expander too! Good god this module is some serious piece of kit! 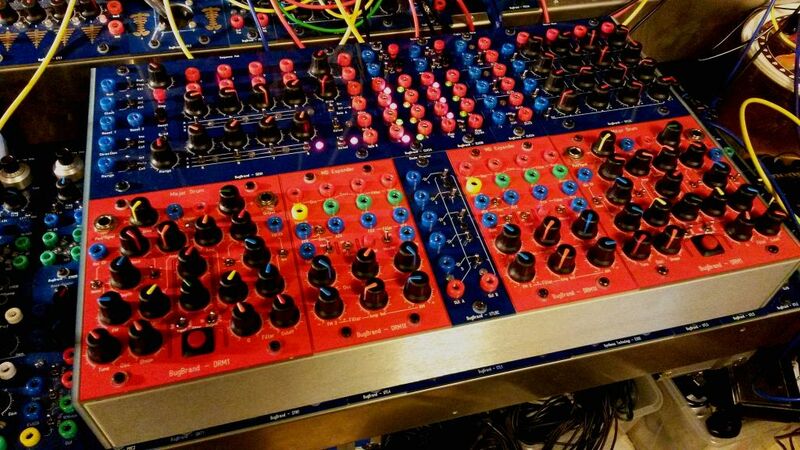 The most amazing thing, imho, is the complexity of the triggering (4 envs per module, triggable in pairs), and the init levels of amplitude for all sections with pos/neg modulation (making it a synth, not a drum, and allowing for all kinds of ducking madness). That's a rather nice looking setup indeed. I agree about the "ducking"-ness of the envelopes... things seem to smash into each other in just the right away. Further enhanced by a compressor. I guess it could be any noise source... but, I wonder if it's a DRM heard on the first part of "Tinker Tailor Soldier Sailor Rich Man Poor Man Beggar Man Thief" from the most recent Radiohead album. That was my first impression anyway. That's stunning Otoskope - someday, somehow, somewhere I'll snag myself a DRM. Hi Tom, did you get enough interest to do a final run? Yes, just not enough time, headspace and cashflow to get it happening as yet. Glad you are seeing it through Tom! Cashflow-wise... might this one make sense to be a pre-order? (Given that the demand is limited to those who have a DRM module.) I would be happy to commit. Very appreciative of your kind offers to pre-order, but you all know I don't like pre-orders. (ie. you can't tie me down to a schedule just yet!). Of course that's fine - I wasn't meaning to disregard the time or headspace factors either. I’ll also through my name in the hat. I would definitely buy one of these. Is there any more news on this? Only took a year to get around to moving this! - and they're not tested yet (quite a lot else to test at the moment) but nearing at least. Hopefully enough to go around (max 30 in total - two batches of 15). We'll have to figure what best to do for people running things standalone as the case will have to be swapped. I'll update here when ready to start taking orders - as I say, got some testing to do first and a few other orders to try to catch up on. Busy busy! Yes, I can certainly supply powered frames! Should I get one and hope for a drm to appear? I can categorically say that I will not be remaking the DRM1 itself and this run is limited to 30. It is just to bring the extra expansion joy to the DRM1s that never got the +X treatment. If you find a DRM1 then sure I can sort you out. I HOPE I CAN GRAB ONE OF THESE FOR MY DRM1!!!! 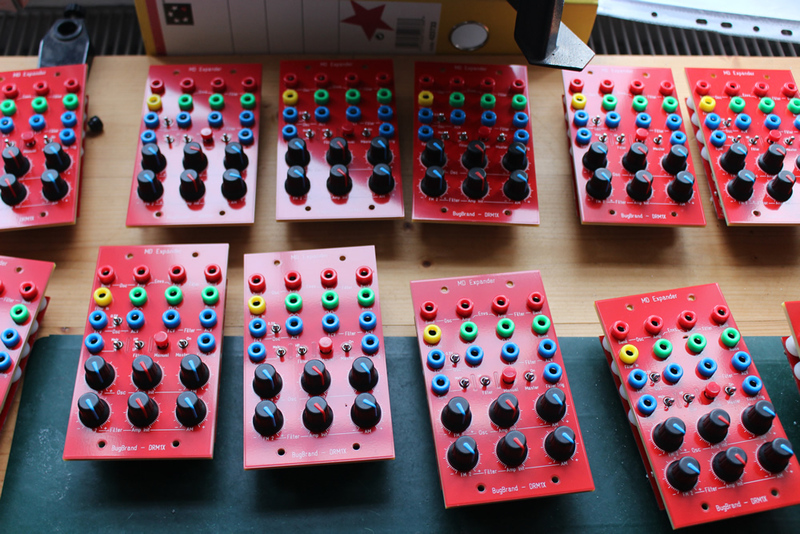 Tom, do you have any 1 slot blank red panels to complete a powered frame for a DRM1+x and DRM2 configuration? I figure you probably don't but if you do I might be interested in moving my two units to a powered frame. Are these going to be offered to people who expressed an interest in this thread last year or is it first come first served via the website? And, yes, I do have red 1FW blanks! Yes! Really pleased you’ve managed to fine time for this! OK, did the the first batch should be completed today - and the final price is £180 (exc. VAT). Combined power draw is 90ma/80mA so should work OK with the standard 100mA per side DCDC (eg. regular 5FW case) - but of course will require a power splitter as there is only one power header on those ones. I also need to check if I have any more old style 5FW cases because the new ones only have 4 front mounting holes - not the full complement of 10 because they were done just for regular 5FW designs.. So, people are welcome to email me now with orders - though I'm still somewhat catching up with Joysticks/DiodeDirectors/BBVs and everything else at the moment! Crap - I literally only have 2 old ones. Though hopefully there might be some spare ones floating around with people who've expanded up to full frames. If/when Tom runs out of 5FW frames for DRM1X, I’ve got a spare one. ^^^ just one instance of how bloody lovely my customers are! Lucky me! But...now I have to await the enclosure on it's way from Norway to Texas. Can't wait to put the updated noiz weapon together!!! I also hope that there aren't going to be issues with power for the 5FW cases --- as mentioned, I checked power consumption again and believed we were fine (10% safety margin on the V+ side) with the regular 100mA per side DCDC (standard for 3 & 5FW cases) but one user seems to have issues, while another works fine. I do have larger DCDCs though only a few PCBs for them, so.. we'll somewhat have to wait and see. Oh... well on the bright side the one I shipped originally housed a DRM1X combo so I guess it should work? Cool Tom PM'd ya and could do with a case but i seem a bit slow on the update. Fingers crossed you still have me down.